Senator Barnaby Joyce today said that the new Labor Government has a lot of work to do to get this country back on track. “The new appointee of the faceless factional bosses, Prime Minster Gillard, has already stated that she wants to get the Government “back on track”, and it certainly is a long way off-track at the moment” said Senator Barnaby Joyce, Shadow Minister for Regional Development, Infrastructure and Water today. 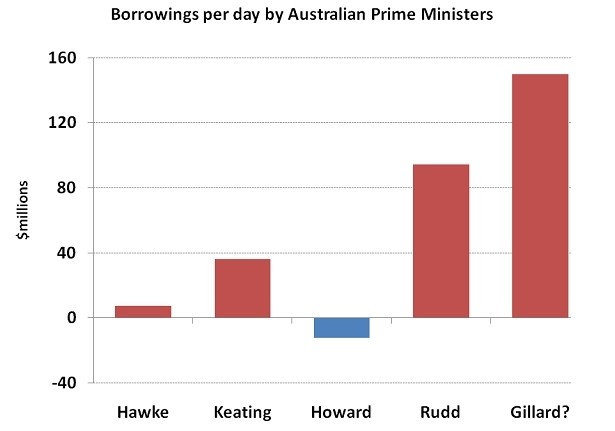 When this Government came to power Australia’s gross debt was $59 billion. It is now $147 billion. This Government has spent $88 billion in 935 days. This is a new record for Australian Prime Ministers. “This Government has been an unmitigated disaster for our country, and even the Labor party now agrees. They have been racking up debt on the national credit card at $95 million a day. “Every day of the Rudd Government, that money could have built almost 500 km of sealed country roads or repaired and refurbished over 100 bridges in regional Australia. Instead, thanks to Julia Gillard and her team we have overpriced trinkets at the back of school yards. .